be quiet! 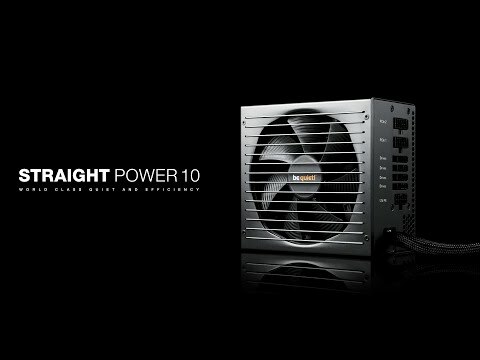 Straight Power 10 500W provides a new level of silent performance for systems that demand whisper-quiet operation and efficiency without compromising on power quality. Improved cooling with use of a 135mm SilentWings® 3 fan with an advanced fan frame ensures operation that is extraordinarily quiet. Powerful GPU support and reliability enhanced by premium 105°C-rated parts make this PSU a ‘Best Choice’ whether you are building a new system or seeking a better, quieter replacement for an existing system. - Advanced fluid-dynamic bearing with copper core provides for greatly reduced operating noise and super-long life. - 6-pole fan motor with high-quality IC controller reduces electrical noise, power consumption, and vibration. Lower starting voltage of the fan reduces significantly the starting fan speed and noise level at low load conditions. • Funnel-shaped fan opening of the PSU case is significant big and allows high airflow intake. • SilentWings® 3 fan is decoupled from the PSU body with special mount, further reducing transmission of vibration and noise. • Optimized PSU airflow design generates superior cooling at lower fan speeds and reduces turbulence around components, thus allowing even quieter operation. • 80PLUS® Gold certification independently verifies the extremely high operating efficiency (up to 93%) of this design. • High efficiency means money savings, because your PC draws less power from the mains to do its work. This means less waste heat, less cooling required, and overall quieter operation. • Standby drain of less than 0.25 Watts (• Meets Energy Star 6.0 guidelines. • Fulfils ErP 2014 guidelines. • Premium quality capacitors rated to 105°C for maximum performance, reliability and operating life. • Full suite of top safety protections defends against over-currents, over- and under-voltages, short circuits, overheating and overloads, thus safeguarding your valuable components. • Four independent 12V-rails improve power signal stability. • Sleeved cable lengths up to 115cm allow for improved cooling and are perfect for large PC cases. • Individual P4 and P8 plugs on longer cables support all common mainboard types and allow routing behind motherboards for improved airflow. • Two PCIe connectors for powerful multi-GPU configurations. • Clearly labelled plugs and clever accessories promote simple installation. Features • Virtually Inaudible Operation achieved through a broad array of meticulous optimizations, including use of a be quiet! SilentWings® 3 135mm fan. • Funnel-Shaped Fan Opening of the PSU case is significantly large, enabling a high airflow intake. • 500 Watts of Continuous Power with stable four 12V-rail design. • 80PLUS® Gold Certification and up to 93% power conversion efficiency. • Sleeved Cable Lengths for improved cooling and more attractive appearance.